Healthy eating is not about going on a strict diet that you feel nauseous at the very thought of it. It is not becoming skinny like a size 0 model or depriving yourself to the extent of going mad with hunger. In fact, it is all about eating, but eating right. Eating right will not only help you lose weight, it will also eliminate many health conditions both physical and mental. Your body will feel energized and so will your brain, if you pack your meals with the necessary nutrients. 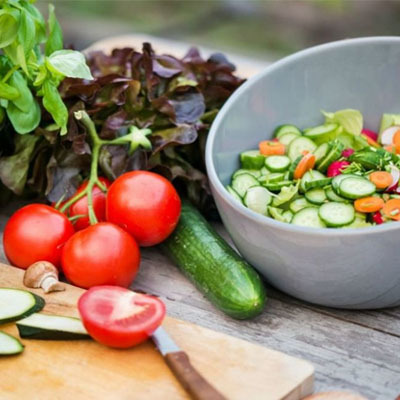 Whether it’s making your meals at home, including more fresh fruit and vegetables, reducing the intake of sugar, eating refined carbohydrates; your dietary pattern is important to have good health and fitness. The key to your diet is moderation. Moderation is consuming only as much as your body requires. Your meal should make you satisfied but not stuffed. Your diet should have a balance of carbohydrate, protein, fat, fiber, vitamins and minerals. Moderation does not mean giving up what you love to eat. It means balancing it out with some organic, healthy foods. For example, if you wish to eat chocolates, consume 100 calories of chocolate but deduct 100 calories from another meal. You can easily balance your meals if you are still hungry by incorporating extra vegetables. Think smaller portions, not complete elimination of food. Whether eating at home or dining out, serve smaller portions. If your meal consists of fish or chicken, add half a cup of rice, mashed potatoes or pasta. You can also add leafy green vegetables or fruit. Eat slowly, as it takes time for your brain to realize your stomach is full. Do not eat in front of the TV, it can lead to overeating. Instead, make one meal of the day a family affair. Eat with family or friends, it offers the emotional benefit of enjoying a meal with others. Reduce sugar! Reduce sugar slowly, so that your taste buds have time to adjust. Try drinking water instead of sugary drinks. You can add some lime or lemon to spice up your water. Avoid eating frozen dinners, canned soups or packaged foods. Reduce eating chocolates, candy and cakes. Instead, munch on natural peanut butters, fruits or peppers when you are hungry. Eat plenty of vegetables and fruits throughout the day. Vegetables and fruits contain minerals, vitamins, fiber and antioxidants. The daily recommendation is a minimum of fiver servings of vegetables and fruits. For example, one serving consists of a small apple, banana or half a cup of raw vegetables. Incorporate greens into your daily diet including kale, spinach, cabbage, mustard greens and broccoli. Snack on berries, snow peas, carrots, cherries. Sweet vegetables such as beets, sweet potatoes, corns, yams and squash also add a healthy sweetness to your meal.